0. What is an MVP? MVP is a Model-View-Presenter in short. It is a derivative from Model-View-Controller (MVC) software architectural pattern. The main concern about MVP structure is that it separates the view from the backend logic. Because Android doesn't care about which pattern to be used when developing, the community developer itself has to debate on which architecture to use. It is well suited in Android because we needed it for easy testability, at least that's what I see when developing an app based on this structure. Just to let you know, this article only covers on how to implement the layering structure WITHOUT testing suite and dependency injection. It is gonna be plain and simple to understand how it works under the hood. You can structure it any way you want but the basic idea is that view updates "decision" is done by the Presenter via View. I've worked with this structure to build an app for my company. There are several reasons why I chose to use it. Though I think this implementation isn't a full MVP because it lacks test capability. But we can learn how it actually works and learn to improve upon it. Also this design is being used in a project I've worked on before, so I will not provide any working example of Github project. This is only for my own future reference and of course for others to learn and critique. Consider the following tree structure which is a modified version of avenging project which nicely separate the modules by core and ui (see top 2 parent directories below). This is not yet an MVP design implementation because we are structuring it based on modules. I think it's easier to maintain it this way for in the future if we want to make the core as a JAR library, it can be done so easily. Other than that, we are gonna make use of several best practices in this codebase such as Builder patterns and Repository pattern for our Model DAO. One edge case I've ran into is when creating a push notification service. After some research, I found that services as such doesn't belong to any of MVP layer (See services directory below). As for the dependencies, I'm using Realm and Shared Preference as my persistence tool and Retrofit as my networking service. Chart below shows how layers are communicating with each other. More on code implementation below. Action/task to be passed to the Presenter from the UI. Such that, when user clicks a button, onUserLogin will be called. Presenter will handle the process. Once processing is done in the Presenter part, Presenter can call one of the interface method to make UI changes. In this example, after a login is successful, Presenter can call onLoginSuccess to tell UI it has done its work. Similar to LoginView, contains other common UI changing interface methods such as showError, showEmpty etc. Put custom action in this interface. Pass other dependencies into the constructor. Every Presenter class must extend a BasePresenter<View> and implement its corresponding ViewAction. Implement method as defined in the ViewAction. To make an API call, simply use apiManager object to call one of the API. Once we have extended BasePresenter and implement the correct ViewAction, we can already use the LoginView to change the UI state. isViewAttached() exists in BasePresenter. This method is to make sure we have attached a correct view instance into the Presenter. Using getView() method is how we access the View instance and do changes according to the Contract we have written earlier. For communication between the Presenter and the UI, see Bridging with the UI section below. 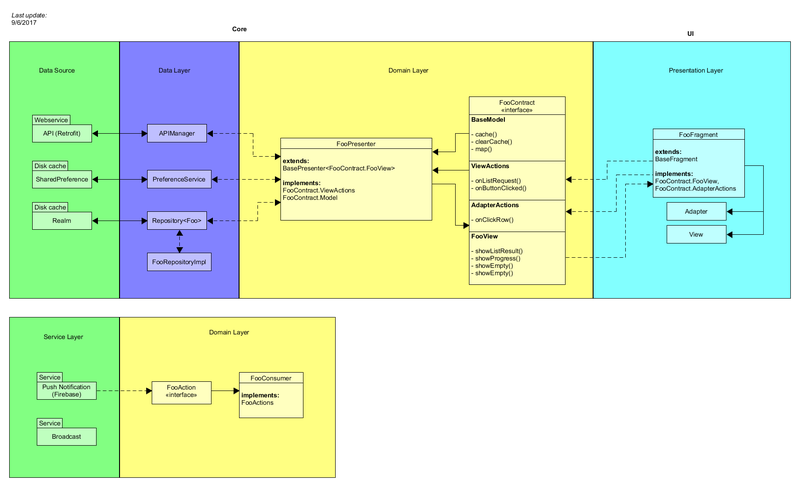 In this model, we define the payload required for the API. Included as well, the Builder methods generated by Intellij plugin, which I forgot which one I used. Add a new endpoint into the interface list. In this case, Login API with user/login endpoint. Refer Retrofit docs for more info on @Body parameter. Add a new concrete method to make use of loginUser interface we have just made earlier. Passing a response listener for OkHttp to make network call. For the sake of brevity and showing example for Login feature, we'll be using these common dependencies to be passed into our Presenter constructor. Ideally, we wouldn't want to write such boilerplates each time we want to pass dependencies into a class. Dagger for dependency injections should be used in this case. The purpose of this class is to allow feature-specific DAO implementation to be used in our Presenter. Naming convention is used such that [FEATURE_NAME]RepositoryImpl. Repository implementation should implements Repository<?> interface. A specification is like Data Access Object (DAO) where we specify our custom queries from Realm, other than common CRUD operations (find, findAll, add, remove etc). For more information about Repository Pattern used in this post, check this article out. This will invoke the Presenter to process our data from the UI. A callback from Presenter must be written in order to change the state of this UI. Refer to Creating feature Presenter in Implementing the backend section for more details on how to change the state of the UI. From here, you can do as much as you want with the UI. Be it showing Toasts, changing layouts, updating views etc. Since the control is done by our Presenter, it can also carry payload as well. So, front end guy would use your data from the backend to feed it to his dummy structured layout. There are however things that should be improved in this design such as the usage of Dependency Injection pattern (we're using a lot of dependency instance), and testing suite for both unit and instrumentation. Are You Anything Like Me?